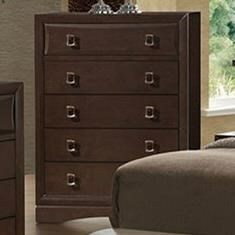 Five spacious drawers are highlighted by fashionable satin nickel hardware on this chest. The top drawer is beveled for added dimension. The Franklin Chest by Holland House at Royal Furniture in the Memphis, Nashville, Jackson, Birmingham area. Product availability may vary. Contact us for the most current availability on this product.